Using Leverage to Create Retirement Income - Can I Retire Yet? Traditional retirement planning focuses on accumulating assets, which eventually are converted into an income stream to last a lifetime. Creating retirement income without exhausting your portfolio presents a fundamental challenge. This is especially problematic for early retirees for three reasons. First, your money may need to last much longer than traditional retirees’. Second, early retirees lack an income floor from social security and the ability to reasonably predict spending on insurance premiums provided by Medicare. Third, there is a large psychological shift from a high savings rate, required to accumulate assets that enable early retirement, to spending down your assets. As I confronted these challenges, I began to look for alternative ideas to generate more retirement income. Two books expanded my thinking beyond using just stocks and bonds to support retirement spending. Robert Kiyosaki’s “Cash Flow Quadrants” introduced me to the idea of using a small business as an investment to generate cash flow. He differentiates business owners, those that work on their business, from the self employed, those who work in their business. Tim Ferriss’ “4-Hour Workweek” introduced the idea of creating a lifestyle business. He rejects the idea of retirement completely. Instead, he promotes building income streams that align with your desired lifestyle. This allows you to live well without delaying gratification. The idea of creating a hobby business to supplement cash flow is appealing. But I found both books long on inspiration, but short on practical advice. 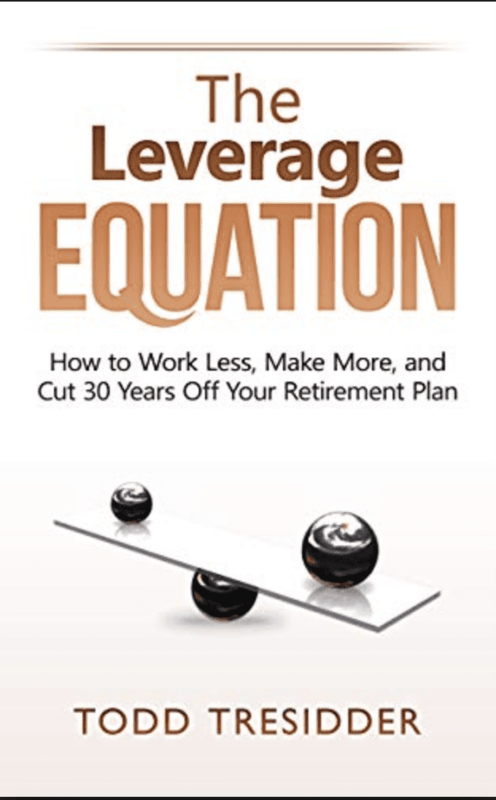 So I was excited to have an opportunity to read and review Todd Tresidder’s new book “The Leverage Equation: How to Work Less, Make More, and Cut 30 Years Off Your Retirement Plan.” Continue reading to learn if this book can help you create new income streams without creating a job. Tresidder’s work has been instrumental on my early retirement planning. In particular, his book “How Much Money Do I Need to Retire” is one of the best personal finance books I’ve ever read. It helped eliminate fear and uncertainty and made planning early retirement a fun and creative process. I was eager to read “The Leverage Equation” due to my past satisfaction with Tresidder’s work and its relevance to my current situation. In the first section of “The Leverage Equation,” he repeatedly makes the argument that two paths to financial independence are using leverage or combining “extreme frugality” with traditional paper investments. I define extreme frugality as a lifestyle of sacrifice. Having achieved financial independence in my early 40’s working a normal job, using traditional unleveraged investments and without sacrificing anything of value made the “extreme frugality” argument ring hollow. Having some financial security gives time and peace of mind to utilize the leverage principles outlined in the book to develop other income streams. They can in turn enable a more abundant retirement. The paths need not be mutually exclusive. Repeatedly beating on the “extreme frugality” drum made the beginning of the book feel like hyperbole. I share that because readers with similar perspectives and life experiences, but being unfamiliar with Tressider’s past work, may be turned off and stop reading. Those willing to look beyond this messaging will be rewarded with practical, well organized, high value content. Tresidder effectively organized a lot of information into three sections: Principles, Strategies and Implementation. Tresidder starts with principles of using leverage to build wealth. His first principle is mathematical expectancy. This concept shifts thinking away from simple probability of success or failure. Instead, he proposes considering the formula of probability times payoff when making financial decisions. You can use leverage to maximize gains when there is a high expectancy. Conversely, he prescribes risk mitigation to limit losses you can’t afford. Other key principles deal with limiting ideas associated with trading time for money. Two particularly resonated with me. The first principle is that you grow wealth by providing value and solving problems. Many people have self-limiting beliefs about money. Leverage is not unethical or impractical. It is simply a tool that allows you to help more people, which in turn increases your value. The second is the principle of making yourself unnecessary. Tresidder uses the phrase “where you’re the cog, then you’re the clog.” The book provides practical exercises to eliminate yourself from your business except where you provide unique value by doing work no one else could do. As I look to build a second income stream as a writer and blogger, leverage is a big piece of the equation. I have the ability to do work one time that can then provide value to many people over years. I can also use leverage principles outlined in the book to eliminate the parts of any work I don’t enjoy, allowing me to focus on work that fits my desired lifestyle. This is a sharp contrast to the work I did in my former career as a physical therapist. In that model, I was “the cog,” requiring the ongoing exchange of my time for money while working around others’ schedules. The financial leverage chapter stands out for two reasons. First, Tresidder emphasizes that financial leverage is unique. It increases potential rewards when it works well, but also magnifies bad outcomes when it fails. He demonstrates this with clear examples. Second, his financial expertise comes through. He effectively explains multiple ways you can incorporate financial leverage, including debt in various forms and using advanced investing techniques such as trading futures contracts and options. He emphasizes the benefits and risks of these instruments and why they should be used only in specific situations when you have appropriate knowledge, experience and ability to control risk. The explanation and application of the remaining five types of leverage take many concepts that are simple, intuitive, and already used unconsciously by most. Tresidder organizes these tools so they can be applied deliberately and strategically to overcome common obstacles. After reading the book, I see numerous applications that can be applied to operating this blog and launching my own book that were not previously apparent. The final section of the book ties together principles and types of leverage in a practical way. Often those teaching a concept present a one size fits all cure for every problem. Tresidder takes a different approach. He emphasizes that when building a business, you must focus on developing efficient and profitable processes first. Leverage is simply a tool that accelerates and amplifies the processes already in place. That can be good or bad. He notes that leverage is both a science and an art form. This enables you to apply the principles and concepts in creative ways that fit your desired lifestyle. He then gives suggestions to start incorporating these tools into your wealth building plan. Most readers find this blog while looking for ways to retire sooner and more securely. There are two segments of our readership that would benefit from this book. For some, the path of saving a high percentage of your income and investing it in simple, low cost, passive investments that we typically advocate doesn’t provide a feasible path to reach your goals. If you are in that camp, The Leverage Equation offers a legitimate alternative path to achieve financial independence quickly. The section on financial leverage alone is worth the cost of the book. It will help frame the risk/reward relationship of alternate investing paths that can draw in those looking for higher returns to speed up the wealth building process. The knowledge shared in The Leverage Equation can help prevent mistakes that could destroy your finances. I frequently write and talk about the need to redefine retirement. A traditional view of retirement can feel restrictive to you, as it does for me. If that idea resonates with you, you’re in the second group for whom The Leverage Equation is an actionable book to help design income streams compatible with your lifestyle. Thanks for the feedback Roseanne. I think you’ll find it a worthwhile read. Thanks for the excellent post Chris! It seems to me that this book ought also to be of interest to retirees (early and otherwise) who are taking a serious look at both very modest forecasts for equity and bond returns going forward, high volatility AND a perfect storm of deficits and unwinding of regulatory protection that could easily result in another ’08-level crisis – or worse. Meaning: lots of incentive to diversify one’s investments outside of paper assets and it sounds like Tresidder’s book provides fresh ideas on ways to do that. Thanks again to you and Darrow for introducing me to this important author. I agree that these are challenging times for anyone looking to live off their investments. For a person who isn’t married to retirement = living off completely passive investments, this book organizes a lot of information and experience and packages in an actionable way. I hope you get value from it. Thomas Anderson has written two excellent books on using leverage wisely to create wealth. “The Value of Debt in Retirement” and “The Value of Debt:How to Use Both Sides of the Balance Sheet to Maximize Wealth”. I have read both, and he has helped me translate some of the tools we used in managing business finances into tools that can be used to manage personal finances. Thanks for sharing Doug. I tend to be very debt averse. While financial leverage, including debt, is covered in this book, there is an emphasis on alternative forms of leverage that don’t carry the same risks. If you decide to read this book, I’d be curious to hear feedback as to how it compares to the others you’ve read. As Chris pointed out, financial leverage is only one of six types of leverage. It’s also the most risky because it’s the only type that cuts both ways. Many people think they understand the term “leverage” because of their misinterpretation that it equates to financial leverage. That was one of my intentions in writing this book was to correct this long held misunderstanding as shared by Doug here. This is an interesting post. I read it a couple times and also the Amazon comments. Will post a comment before reading the book. Todd’s first chapters will be agreeable to my experience. I do think MrMoney… has a strong argument as does Dave Ramsey, but as always it depends on your temperament, value system, and achievements. For me it is a very common sense way to achieve high savings rate and return of income with zero risk. The chapters on leveraging finances will make more sense for those in early wealth building. Especially, if your young and acquired an attractive vocation with busisnesses that have record of stability. Problem is most youth will start having kids and lose one income stream then fully embrace indebtedness for max standard of living. Thus, fisticuff themselves for twenty years to keep the head above water. I never did this, but should have paid more attention to fund investment. I read a piece on Gintel Fund once in dentist office. I put my savings in that fund and per common advice, forgot about it for a couple decades, until reading another article describing the worst fund in history. Yes, Gintel. I think I was the last one out. A side note per my observations. The biggest challenge to finances is what Chris advocates, “choose the path of least regret risk”. When reading and hearing of personal testimony of average investors, the biggest challenge is to avoid “big” mistakes. You can take a less return for the trade off of a life time of no regrets. If you catch yourself justifying more risk out side of acceptable, common sense, and proven just say no. High leverage real estate has risk. Stock picking has risk and so does debt. The bank can take your savings at any point in time that you fumble with your financial plan. I’ve heard to many stories of life burden woes from the ’08-’09 recession. Sure, these people did have busisnesses and employment that made it all risky. They got caught up the business of making good money and lost site of protecting long term interests. Sad outcomes with wealth and influence gone. They did leverage for business opportunity. A once in lifetime opportunity per their dreams and abilities. They did make good money, until. I did some major risk, but hedged my risk. First, rental properties, was a natural investment that has worked well with my abilities and did so for going on 40 years. I utilized real estate to finance more risky business opportunities. Michigan had a depression instead of a recession in ’08-’09. Automotive for one was running away from our high labor union state. Our state had horrible regulation and tax burden that incentivised companies that could, to move elsewhere. That’s all changed now and the state, so far, is leading the country in job growth. My, new founded machine shop business, required extreme leverage for growth and reputation of success. A lot of enthusiast in the Machine Tool business all decided a great time to finally take the plunge, this at a time just a few years before the recession. I decided against the levage per the high cost and risk. Was so glad as it was tough enough to eek out a living with spouse working elsewhere. But, so many businesses suffered bankruptcies and so many loss life savings. You know these people are recovering and fully embracing the Dave Ramsey or MrMoney’s form of austerity for safe savings. I don’t disagree with anything Todd says in the book, I just would characterize it differently. My wife and I saved roughly 50% of our professional incomes throughout our careers. Compared to an average savings rate, our savings rate was “extreme” (About 10X the “normal”). I just personally don’t like the term extreme frugality for the negative connotations that I personally associate with that phrase. Others who took a similar path, as I noted in the review, may feel the same. I would honestly be embarrassed to tell someone I lived a life of extreme frugality, given the upper middle class lifestyle I’ve lived while saving for early retirement. I shared my feeling when reading the book not so much as criticism, but rather to encourage others who feel the same to continue reading for the otherwise excellent content. I would disagree that this book would make more sense only for those early in the wealth building process. The book was very applicable to me today as I look to create additional income streams to support our long retirement time horizon. Thanks for the clarification. I have read your blog for a few years now. That is an incredible savings rate. We had good income with my engineering, but we lost out on our dual income streams. A stay at home mom, then low income self employment with working spouse. We made the mistake of having to much debt leverage. We could have made things easier during our 40-60’s, but the net result is our retirement has good funding. Everything is paid off and rental income will be sufficient until we take SS at a late age. Then we will sell our real estate and have an over funded retirement. I really don’t enjoy higher standard of living. Funny, that financial advisor claims senior’s worry so of running out of money that they hoard and scrimp and never fully enjoy their savings only to leave assets to their kids that do go on to enjoy. An annuity salesmen. Funny how they discount SS which is the grandad of annuities and the most valuable. Michigan really had a devastating recessions and was comparable to the Great Depression stats. Just a horrible time to grow a new business. I will say your circumstances were much different that those that I know and read of those that expose the benefits of frugal cost of living. I don’t know about the term extreme frugality, but the Mustache blog sure would fit. My mind change happened while working a stint in London Ontario company. My corporation would send engineers on long term job assignment to help fill need. I sat next to this older retiree that was called back into action. I noticed his frugal lunch and expenditures and questioned him. He educated me on the time value of avoiding wasteful daily expenditures and the blown opportunity to save, nonetheless enjoy a better diet in doing so. Back then Canadian’s had a real uphill battle to improve standard of living thanks to a socialist government.